For seventeen years, scientists have been examining this balance sheet with a series of space-based sensors known as Clouds and the Earth’s Radiant Energy System, or CERES. The instruments use scanning radiometers to measure both the shortwave solar energy reflected by the planet (albedo) and the longwave thermal energy emitted by it. The first CERES went into space in 1997 on the Tropical Rainfall Measuring Mission, and three more have gone up on Terra, Aqua, and Suomi-NPP. The last remaining CERES instrument will fly on the JPSS-1 satellite, and a follow-on, the Radiation Budget Instrument (RBI), will fly on JPSS-2. If Earth was completely covered in ice, its albedo would be about 0.84, meaning it would reflect most (84 percent) of the sunlight that hit it. On the other hand, if Earth was covered by a dark green forest canopy, the albedo would be about 0.14 (most of the sunlight would get absorbed). Changes in ice cover, cloudiness, airborne pollution, or land cover (from forest to farmland, for instance) all have subtle effects on global albedo. Using satellite measurements accumulated since the late 1970s, scientists estimate Earth’s average albedo is about about 0.30. The maps above show how the reflectivity of Earth—the amount of sunlight reflected back into space—changed between March 1, 2000, and December 31, 2011. 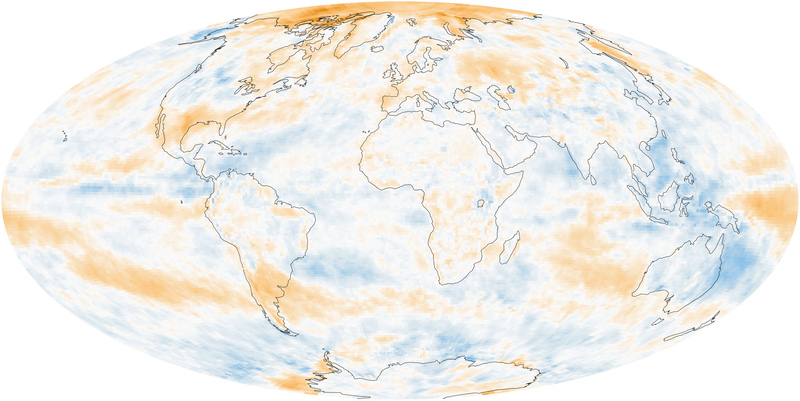 This global picture of reflectivity (also called albedo) appears to be a muddle, with different areas reflecting more or less sunlight over the 12-year record. Shades of blue mark areas that reflected more sunlight over time (increasing albedo), and orange areas denote less reflection (lower albedo). Taken across the planet, no significant global trend appears. As noted in the anomaly plot below, global albedo rose and fell in different years, but did not necessarily head in either direction for long. In the maps at the top of the page, however, some regional patterns emerge. At the North Pole, reflectivity decreased markedly, a result of the declining sea ice on the Arctic Ocean and increasing dust and soot on top of the ice. Around the South Pole, reflectivity is down around West Antarctica and up slightly in parts of East Antarctica, but there is no net gain or loss. At the same time, Antarctic sea ice there has been increasing slightly each year. One of the most compelling parts of the global map is the signature of the El Niño–Southern Oscillation (ENSO) pattern in the Pacific Ocean (right and left ends of the global map). The first seven years of the CERES data record were characterized by relatively weak El Niño events, but this soon gave way to some moderate-to-strong La Niña events in the latter part of the record. La Niña tends to bring more convection and cloudiness over the western Pacific Ocean, while El Niño brings those rain clouds to the central Pacific. In very strong El Niños, the convection can even travel to the eastern Pacific. The map of CERES reflectivity changes shows an increase in reflectivity in the western tropical Pacific (blue patches in the figure) and reduced reflectivity (orange colors) in the central Pacific—patterns consistent with a shift from El Niño to La Niña during the CERES period. In the early 2000s, after the first few years of Terra-CERES measurements, it appeared that Earth’s albedo was declining, a phenomenon that was widely reported in scientific journals and on NASA Earth Observatory. 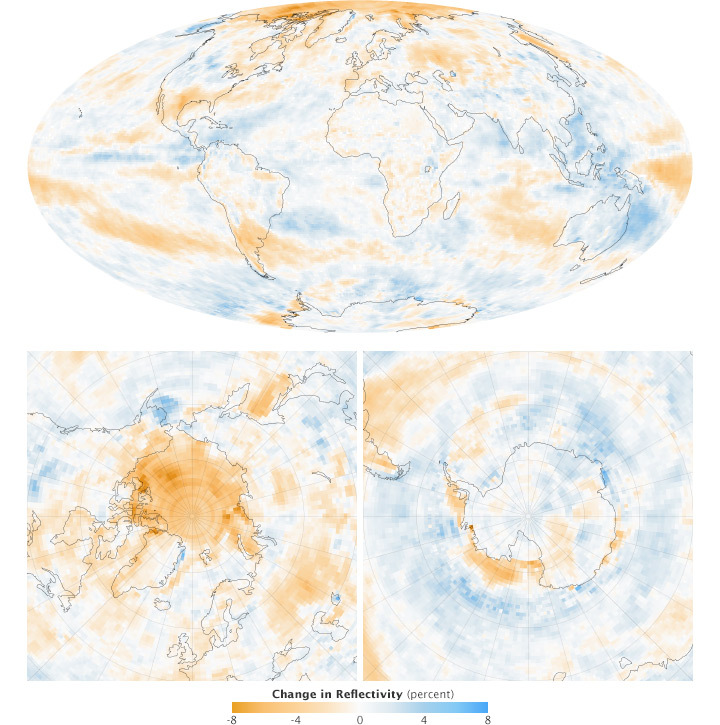 But as more years of data accumulated, and as scientists began to better understand the data, they found that albedo was neither increasing nor declining over time. It was fluctuating a lot by year, though. Loeb, N.G. et al. (2012) Observed changes in top-of-the-atmosphere radiation and upper-ocean heating consistent within uncertainty. Nature Geoscience, 5, 110–113. NASA Langley Research Center (2014) CERES. Accessed October 13, 2014.